When it comes to the food, catering and pharmaceutical sectors, cold room storage space is often a premium. 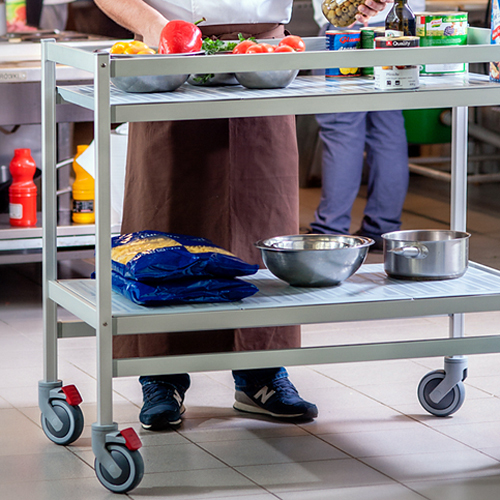 The Optima range of cold room mobile shelving systems is the ideal space-saving solution and this type of racking is now widely used in large cold rooms, commercial kitchens and pharmaceutical facilities. 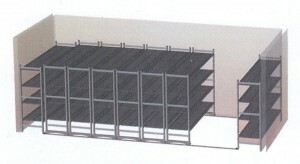 Event caterers, who use cold room racking in a different way, find this shelving a big help in their business. Another highly effective use for mobile shelving is in warehousing. Warehouse operators can enjoy arranging their warehouse space with greater flexibility and thereby improve storage capacity and efficiency. 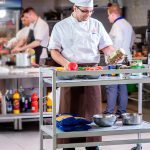 The Optima mobile system is built from their standard cold room shelving units and fitted with casters which travel within specially designed channels. So if you want mobile, modular, ergonomic and personalized shelving for your cold storage, this is the mobile racking system for you. Sloping shelves are an option for display use. Shelving depth: 500mm or 600mm. NOTE: To avoid risk of tipping we do not recommend shelf depth less than 500mm. Variable shelf length: 663mm to 1854mm ~ Shelf inserts: 4 sizes ~ All PVC inserts are dishwasher safe. For more details including load capacity please read the mobile shelving pdf. This lockable trolley system is ideal for restaurants, hotels and hospitals (any areas of catering used by the general public). There is also a sloping shelf option for display use – very popular with grocers and chocolatiers. Number of shelves: 2. Trays are an option. All PVC inserts are dishwasher safe. More details are on the mobile shelving pdf. 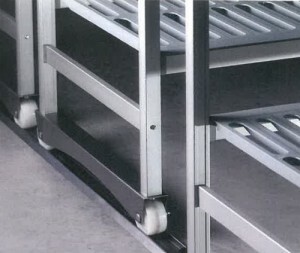 If mobile shelving is not for you and you need static racking, visit our standard cold room shelving page.